A wealth of new photos. Over 570 Irish Islands – a wealth of information on the wildlife, stories and history of the islands. For those wishing to visit in small boats or kayaks there are details of: Landings, Camping, Drinking water and Tidal information. 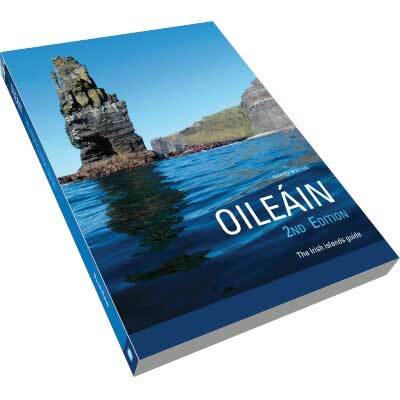 Oileáin is a detailed guide to almost every Irish offshore island. The guide is comprehensive, describing over 570 islands, big and small, far out to sea and close in by the shore, inhabited and uninhabited. Oileáin tells it as it is, rock by rock, good and bad, pleasant and otherwise. It concentrates on landings and access generally, then adds information on camping, drinking water, tides, history, climbing, birds, whales, dolphins, legends or anything else of interest. Oileáin will, I hope, appeal to all who go to sea in small boats. David Walsh is a Dublin solicitor and Notary Public, living and working in Ranelagh with his wife Sheila. He has four children: Justin, Daire, Sarah and Orla, and grandson Thomas. Originally a keen walker, then climber, he has always also had a wide general interest in outdoor pursuits, including cycling, birding, canoeing and some SCUBA. On a sailing/climbing trip to Spitsbergen in 1990 he saw sea kayaks glide between icebergs in remote frozen Magdalena Fjord. He was blown away, and the next part of his life began immediately. He bought a sea kayak within weeks of getting home, and kayaking has consumed his life ever since. By summer 1991 he was climbing new routes on offshore islands previously unheard of in climbing philosophy. Islands became David’s focus. Since first it became apparent that his ‘islanding’ was something remarkable he has been rigorously audited by Irish sea kayaking. David has of date of writing in July 2013 verifiably visited 503 of the current 574 islands dealt with in Oileáin. He was a founder member of Irish Sea Kayaking Association and held the position of Chairman from 1995 to 2003, relinquishing the post only to see to the publication of the initial Oileáin. When he started exploring Ireland’s coastline and islands, his climbing background told, and he instinctively started recording his experience. On a kayaking trip in 1993 up the west coast with his ever faithful Fred Cooney in attendance, passaging Inishbofin to Inishturk, they failed to land Davillaun Island. The ‘why’ of that begat Oileáin. The disappointment that there wasn’t available such simple information as ‘landing half way along SE side’ drove the whole project over the following 20 years.